After reading Dark Horse, the first book in the series, I was eager to continue on with it. 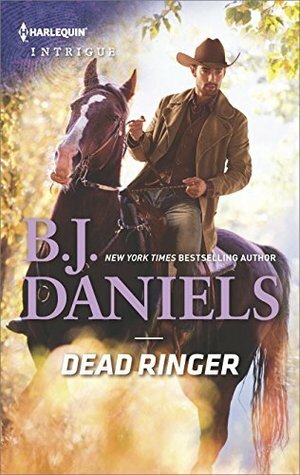 So I quickly dove into Dead Ringer. This is a very quick book to read, I got through it in a couple of hours.I found the flow of this story to be really good, smoothly going from one moment to another, which really helps to pull the reader fully into the story. The only downside is that I found the book didn’t stick with it. A couple of days after reading it, I had begun to forget big chunks of it. Which makes reviewing it a bit difficult but I will do my best. One thing I do know if that I enjoyed this one more than the first book, despite the story of the book fading fairly quickly from my memory. I can’t say that the characters really stood out to me, as many of them had been introduced in Dark Horse and it was simply their turn to be in the lime light. It was the fast paced story that was the thing I enjoyed the most. From the moment you start reading, you are left wondering what will happen next and just how things will turn out, not just for the main characters but those who have smaller side rolls as well. I did have one issue with the book, however I won’t do into too much detail so as to not spoil it for anyone who hasn’t read it yet. But there was one clue that should have been caught by pretty much every family member but wasn’t until the very end when a new and sudden element came into play. The only person who noticed it was the mother, who since she’s in a asylum couldn’t really put it into words, but her reaction should have clued in the others, especially her ex-husband who was there at the time. Overall, this was a pretty good book. It’s just a shame that it didn’t stick with me. I will be continuing on with the rest of the series to see how the story ends. If you are looking for a quick and entertaining read, then this series might be for you. This entry was posted in Books, Romance, Suspense, Western Romance and tagged Book Review, Books, Romance, Suspense, Western Romance. Bookmark the permalink.